The good old Red Sea in Egypt is one of the most popular tourist destinations in the world, today it was made more special after a woman gave birth in the iconic location. We’re not kidding! Curious spectators in the resort town of Dahab, north of Sharm el-Sheikh, were left amazed as they saw a woman, whose name has not been disclosed but is thought to be Russian, give birth. Moments afterward a man, reportedly the woman’s spouse, appeared from the water holding the newborn in his arms. The wife followed shortly after to join her newborn baby and her partner so they could all rejoice in the miracle they had just witnessed. What an incredible moment to live by. 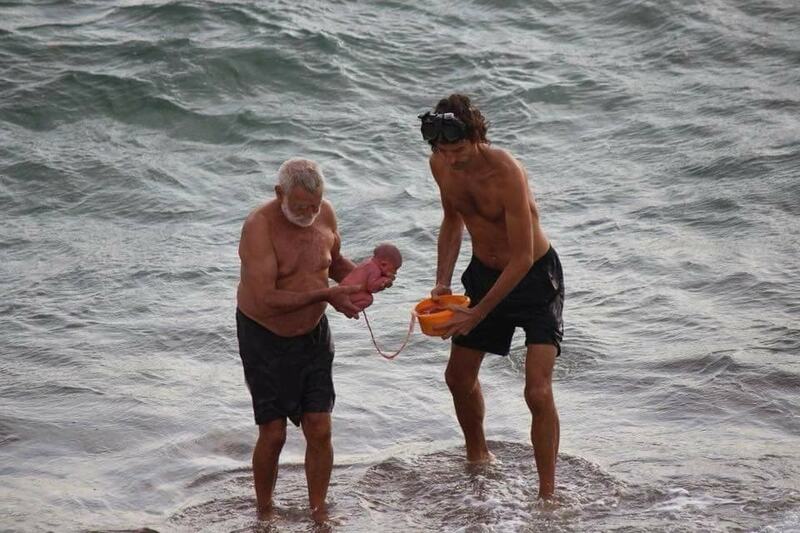 Having your baby born in the sea where the great old stories come from. The story of how Moses crossed the sea with his followers. According to some Egyptian sayings, having your baby born in the red sea means that the child would do great wonders in the world. Tourists watching from the side were absolutely astonished as they could not believe what they were seeing. The baby was born perfectly healthy without any nurses around or any medical instruments. Hadia Hosny El Said captured these spectacular pictures from the gallery of her uncle’s flat in Dahab, north of Sharm el-Sheikh, showing the new father rising from the ocean helping to carry his newborn. Talk about a dramatic scene of a thriller movie where the hero just helped his wife deliver their baby on a stranded island and now he’s off to fight some villain. Minutes later the mother also rose from the sea looking as if she had just been there for a casual swim, before being rejoined with her child and husband on the shore. Those who saw the birth took photographs of the baby’s father and a doctor (reportedly also Russian) who specializes in undersea births. Images of the father, doctor, and woman emerging from the Red Sea have now gone viral on social media. Photos showed the dad holding the newborn with the umbilical cord still joined and the placenta in a plastic box. All of which were caught by a tourist from a hotel balcony and Haida from her Uncles flat. According to eyewitness accounts, the woman gave birth after going into the sea only wearing a bikini. People took to Facebook to praise the ‘charm’ and ‘ease’ of the baby’s water birth. Local media reports propose Dahab, situated on the south-eastern coast of the Sinai Peninsula (50 miles north-east from Sharm el-Sheikh), has grown frequently popular with mother-to-be who want to have a water birth in the sea. Water births are a traditional alternative to giving birth in the air because countless women find the sensation of being engulfed in hot water extremely relaxing. Which means they experience less pain throughout the contractions and the childbirth itself. Babies born undersea are usually relaxed than those born in the air, and manage to struggle and cry less after leaving the mother, according to guidance from public fitness body NCT. Water births work because the breathing reflex is triggered by the difference in temperature as the baby is born and the feeling of air on the skin. This means that granted the baby remains fully immersed in warm water, they proceed to receive oxygen through the umbilical cord till they surface meaning they do not suffocate. While there is no distinct statistical data that proves babies born in water receive health advantages, that means the contrary is also true – that there are no explicit negative effects either. However, water births are normally not recommended for mothers who have experienced difficulties during their pregnancy because the baby may need to be observed with delicate electronic equipment that cannot go in the water. Water births are also not suggested for very overweight mothers who may struggle to get out of the water should their birthing strategy need to change quickly. If you’re trying a home water birth, efforts should be taken to keep the water below 37C. A higher temperature risks overheating the newborn and causing unnecessary strain. While lower temperatures are not advised, this is largely because it opposes many of the benefits to the mother – such as extended comfort – rather than because it could injure the child.